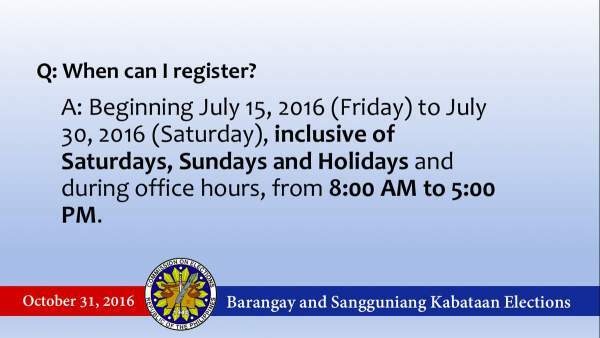 Schedule and Qualifications: Comelec voter's registration for 2016 Barangay, SK election - Balita Boss! The Commission on Elections (COMELEC) will be conducting voters' registration for the 2016 Barangay and SK elections on Friday, July 15, until Saturday, July 30. The Barangay elections will be held simultaneous with the Sangguniang Kabataan (SK) elections on October 31, 2016. Comelec offices will be open from 8 am to 5 pm. It will also be open on weekends and holidays. Not otherwise disqualified by law. Registered Voters as of May 9, 2016 National and Local Elections and those who will register for the Barangay Election who are eighteen (18) but not more than thirty (30) years old on or before October 31, 2016 shall be included in the list of voters for the Katipunan ng Kabataan. Any person, who has not reached the required voting age or period of residence on the day of registration but will possess such qualifications on or before the October 31, 2016 Barangay and SK Elections may register as voter. Application forms for voter's registration are available in Comelec website, http://www.comelec.gov.ph/?r=2016BSKE/VoterRegistration/ApplicationForms. The forms should be printed on a long bond paper and must be filed three copies at the local COMELEC office in the city or municipality where you reside. To download the Comelec Resolution 10148, please click here or here.